Lunch may just be the hardest meal to plan as most people need something that’s portable, make that a healthy low-carb lunch and it’s even harder. 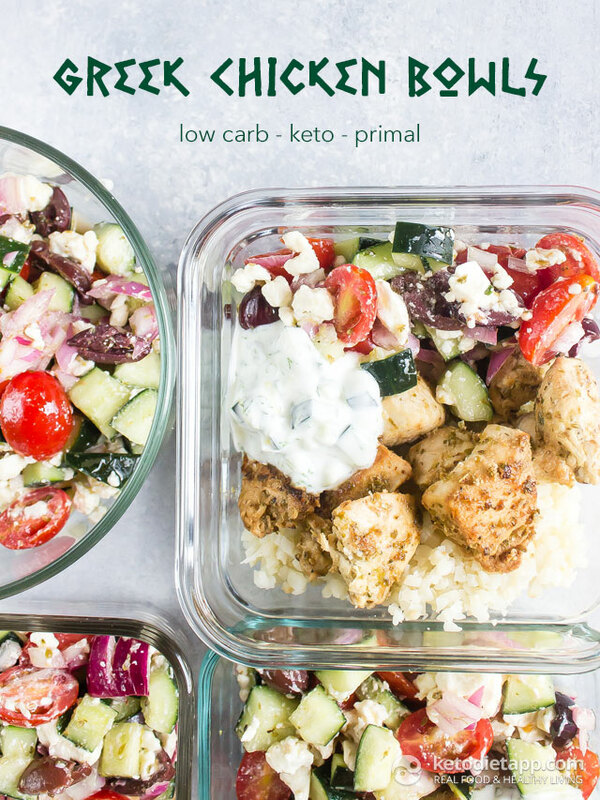 Enter these keto friendly Greek Chicken Bowls! These bowls are packed full of flavor and it’s the perfect recipe for batch cooking multiple servings at one time. 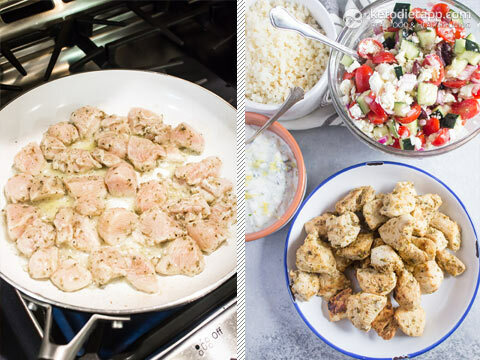 First up we have the Greek chicken which is marinated in a tangy Greek vinaigrette for an awesome flavor punch. Then we have some cauliflower rice, a Greek style salsa, and some Tzatziki to top it all off. This might just be my favorite lunch option ever! Cut the chicken into 1-inch (2 cm) cubes. 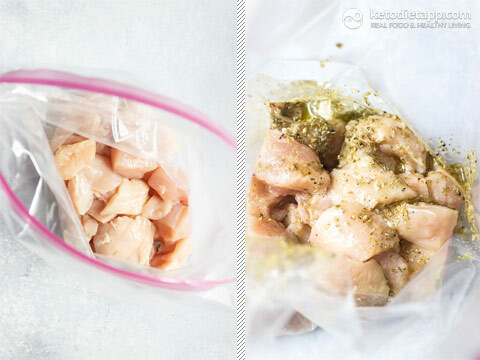 Place in a sealable container with the remaining marinade ingredients. Toss to coat. Let the chicken marinate for at least 30 minutes. While the chicken is marinating make the salsa by dicing the cucumber, halving the tomatoes, and dicing the onion. Place into a medium bowl with the olives and toss with olive oil, vinegar, and oregano. Gently stir in the feta cheese. Taste for salt and add more if needed. 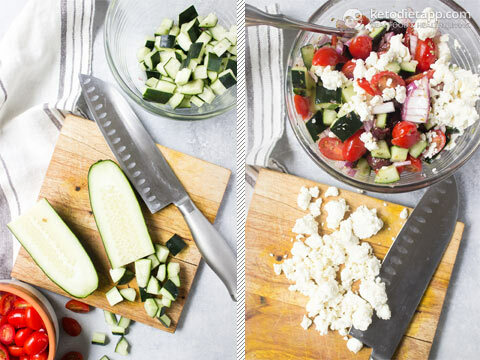 For the Tzatziki combine the yogurt with the minced cucumber, minced garlic, lemon zest and juice, and dill in a medium bowl. Season with salt and pepper to your taste. Once the chicken has marinated heat a large skillet over medium high heat. Add the chicken along with the marinade in a single layer. Cook 4 minutes per side or until each side is golden and the chicken is cooked through. Remove from pan and set aside. Optional if using cauli-rice: Add the cauliflower rice (here's how to make cauli-rice) to the same skillet scraping up any stuck on pieces of marinade from the bottom. Cook just until soft. 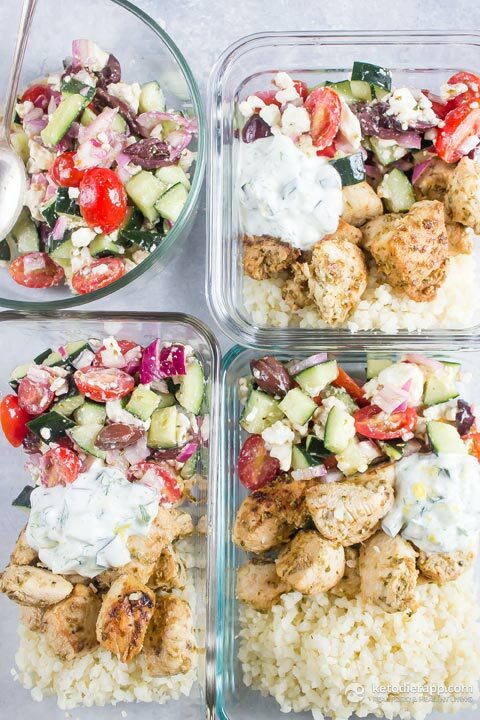 To assemble divide the chicken and cauliflower rice between four containers. Layer in the salsa and top with Tzatziki. These bowls will keep for 4-5 days in the refrigerator. Sensational! Keep these clean eating keto recipes coming please! I dont like yogurt, do you think I could use creme freche instead? Absolutely, creme fraiche or sour cream are good alternatives to yogurt. Does the nutritional info per serving include the cauliflower rice? Hi Katie, cauli-rice is not included. Optional ingredients are not included in the nutrition facts. Hi, forbus single gals, does this heat up well, or do you just eat the chicken cold? Can't say I've ever had heated yogurt, but I am no chef so I have no idea. Great recipe. Very tasty. I love the Tzatziki! Thank you! Yes, this heats up well (the chicken and cauli-rice). The salad can be prepared in advance and stored in the fridge for 1-2 days. This is a great recipe! I've shared it with friends who love it too! Thank you very much. Oh my gosh - the chicken really surprised me. It was incredibly simple to make and absolutely delicious. 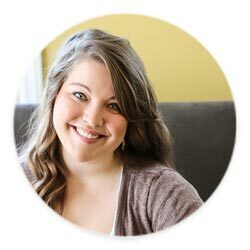 Thanks so much, it's rather hard sometimes to keep coming up with low carb, healthy options, so I appreciate your site very much! Thanks for great recipes! I will try this, gives a nice different flavor and I like the multiple bowls for later uses.